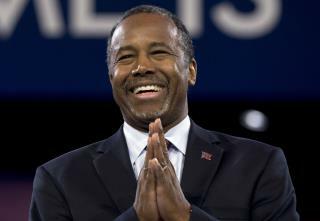 (Newser) – Former rival Ben Carson is set to endorse Republican presidential frontrunner Donald Trump on Friday, the Washington Post reports, citing two sources "familiar with [Carson's] thinking." The two sat down together at a "luxury club" Trump owns in Florida and finalized the agreement on Thursday. The endorsement comes despite what the Post calls Trump's "blistering critiques" of Carson early in the contest. Those critiques included comparing Carson to a child molester at one point, according to USA Today. Christie wasn't an endorsement. Trump just hired the best caterers and the fat RINO followed him. OMG, poor Donald....is this the new GOP plan to stop Trump???? Darn, it might just work.